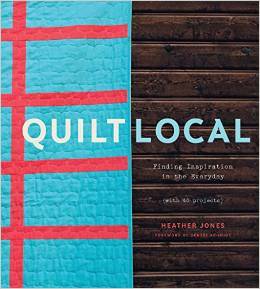 Join Heather Jones, the founder of the Cincinnati Modern Quilt Guild, at Sewn Studio on October 7 to celebrate the release of her book Quilt Local! There will be a trunk show of her quilts, she'll offer insight into her process, and you can get your copy of the book signed. The event will take place from 6:30pm to 8:30pm on Wednesday, October 7. There is no cost to attend, but Sewn does ask that you pre-register. And Julie from Sewn is offering a generous discount of 15% if you reserve your copy of the book before the event! Hope you're able to come out and support Heather!